Controlling Hazardous Fumes during the Electroplating Process - Sentry Air Systems, Inc.
Electroplating is a metal finishing process in which an object is covered with a metal coating. This process changes the chemical, physical, and mechanical properties of the work piece and helps protect the object from abrasion or corrosion. Additional benefits may include lubricity, wear resistance, solderability, added material thickness and various aesthetic qualities. Many types of industries use this process but it is most commonly found in the jewelry and automotive industry where objects are coated with gold, silver and chrome for decorative effects. Throughout the electroplating process, operators are exposed to hazardous chemical vapor, fume and mist that have negative health effects if inhaled. Chromium, Nickel and Cadmium are all on the International Agency for Research on Cancer’s (IARC) list of known human carcinogens. According to the Occupational Safety & Health Administration (OSHA), workers performing electroplating are exposed to hexavalent chromium which can cause severe health effects including lung cancer. When handling and manipulating these metals, it is important to establish a ventilation plan that includes engineering safety controls for increased respiratory protection. Pre-cleaning an object before it gets plated is arguably the most important step. During this stage, grease, fingerprints, dust, grime and other foreign particles are removed from the object. This process usually requires both physical and chemical cleaning. Chemical cleaning predominantly requires the use of various alkaline and acids. For this step, consider using a table or bench top fume extraction system with an activated carbon filter for removing odorous, harmful fumes. Our Model 300 Winged Sentry with Lid provides up to 350 CFM to pull fumes away from the operators breathing zone and into the filter chamber. The clear acrylic lid allows greater fume source-containment and still allows operators to work between the unit’s “wings”. Our activated carbon filters utilize thousands of tiny carbon granules to adsorb odors before entering the surrounding work area; making them a great solution to hazardous odor control. Once cleaned, the object is placed in a liquid solution called an electrolyte, otherwise referred to as the “plating bath”. The bath is a specially designed chemical solution that contains the desired metal dissolved in a form of submicroscopic metallic particles. In addition, various substances are introduced in the bath to obtain smooth and bright deposits. The solution acts as a positive charge to the negatively charged object that is to be plated. Once an electrical current is passed through the solution, the positive ions form a thin layer around the object through a process called “electrodeposition”. This chemical slurry emits vapors, odors and mist that should be vented away from the operator and surrounding work area. Robbins Brothers, a national jeweler, came to us with their electroplating application and we provided them with two of our ducted exhaust hoods (pictured above). These hoods work great in high volume chemical and VOC applications that require exterior exhaust. You can read their testimonial here. Polishing and buffing machines may be used during the final stages of metal finishing. This step generates fine dusts that may become respirable and enter the ambient room air. Long term exposure to such dusts can lead to a host of negative health effects including inflammatory reactions within the lungs, coughing, chest tightness and shortness of breath. As a secondary engineering safety control, consider a room air cleaner for your work space. Our line of room air cleaners come in a variety of sizes and strength and work to “polish” the ambient air workers breathe. 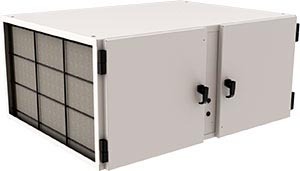 In particular, our Model 650 Room Air Cleaner is a commercial-grade air filtration system with a quad-filter chamber. Multiple mounting and filter options, makes this unit great for applications that generate both odors and particulates. For more information about controlling electroplating fumes, or to receive a free quote, contact Sentry Air Systems at sales@sentryair.com, or call 800.799.4609, visit our website www.sentryair.comor fill out the feedback form below.